Some people have the magic touch in their chosen field. Fred Astaire ruled the dancing world, The Beatles ruled pop music, and Frank Sinatra turned modern ballads into standards. Well, ahem, Chris Sanders may not be quite in their league creatively (meaning no disrespect to Sanders, because nobody is in their league), but what the man has accomplished over the past decade is showing similar signs of success. Sanders was the driving creative force behind Disney's Lilo & Stich (2002), which was the studio's only hit of the early 2000s. That might have led Sanders to turn inward and live off of his own personal cottage industry of Lilo & Stich riffs, but he had bigger plans. Sanders next worked up a story that eventually turned into Bolt (2008), but the new Pixar honchos ran him out ("he negotiated an exit") and turned Sanders' promising idea into a near-fiasco. Finding the pastures greener at Dreamworks Animation, Sanders then worked up "How to Train Your Dragon" (2010), which became a huge hit and itself spawned a cottage industry of sequels, television series and stage shows. Once again, Sanders could have sat on his laurels, but instead he became the director and screenwriter (with Kirk DeMicco) of "The Croods" (2013), starring Nicholas Cage and Emma Stone. Sanders is one of the top creative geniuses you probably have never heard of, and he throws his reputation on the line again with this film. 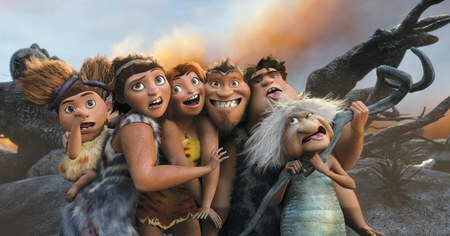 The Croods, including Grug's mother-in-law on the right. "The Croods" is a film about prehistoric Neanderthals and their struggle with a changing world. Grug (Nicholas Cage) and Ugga (Catherine Keener) have daughters Eep (Emma Stone), Sandy (Randy Thom) and son Thunk (Clark Duke), and they are joined by Grug's mother-in-law (Cloris Leachman). The overprotective Grug warns the family about being too curious and does everything that he can to keep them out of trouble. While Grug's caution has served the family well, keeping it alive while most of their neighbors have died, Eep is inherently curious. One night, Eep waits until the family is asleep in its cave and ventures out to do a little exploring. 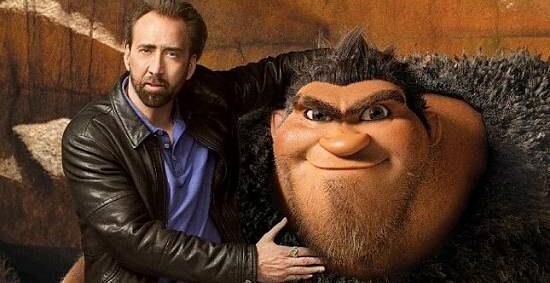 Nicholas Cage and his character, Grug. While wandering outside, Eep meets Guy (Ryan Reynolds). Guy is a proto-human who has figured out the secret of fire, and he also believes that the world is coming to an end. The two become friends, and he gives her a special horn to blow in case she needs help. After he leaves, Grug finds Eep after a frantic search and takes her home. 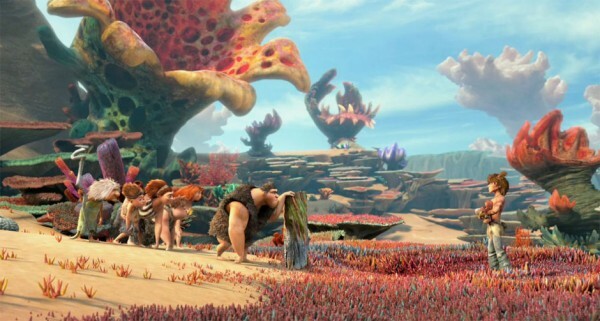 Unfortunately, though, their home has been destroyed by an earthquake, so the Croods have to find new quarters. 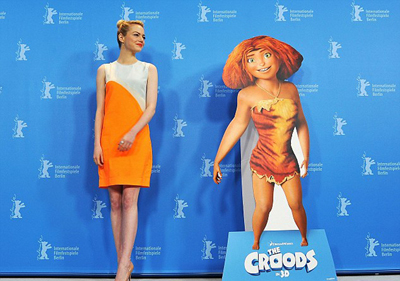 Emma Stone and her character, Eep. The family discovers a strange new world, but it is full of dangers. They are attacked by red-furred birds, so Eep sounds a horn which brings Guy to the rescue. He uses a torch to scare away the birds, and everybody is fascinated by the fire. Stealing the torch, the Croods mis-use it and create chaos by setting everything around them on fire, including some giant corn which pops to create fireworks. Grug decides that Guy is valuable, if a bit dangerous, so he forces Guy to lead them to a safe cave in a nearby mountain. Guy and his pet sloth (Chris Sanders) build a lure to capture some game. After eating, Grug again warns against wandering away from the family. Guy, though, counters with his own story about a paradise that he calls "Tomorrow." The next morning, the family continues its journey, but is stopped by a path full of sharp rocks. Guy creates shoes for them so that they are able to walk on the sharp rocks. Ryan Reynolds and Emma Stone. Emma later won an Academy Award for Best Actress in 2017. Grug feels jealous about this and other ideas that Guy has, but the family is drawn to Guy and his idea of "Tomorrow." After everyone rejects his idea of finding another cave, Grug explodes and attacks Guy. They wind up in a tar pit, and, as they struggle to escape, reconcile their differences and become friends. The Croods climb out of the ruins of their world. They finally reach "Tomorrow," but are stymied by a steep pit. Grug throws everyone over it, then manages to get across himself by using some birds to fly him to the other side. Meanwhile, it turns out that they escaped their own land just in time, as Guy's premonition that the world is about to end comes true and they see the land on the other side of the pit destroyed. Safe in a wonderful new land, Grug learns to be less over-protective, and the family finds a new home in "Tomorrow." 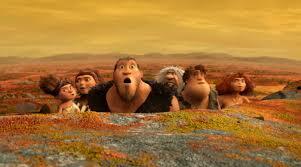 The Croods discover a new land. 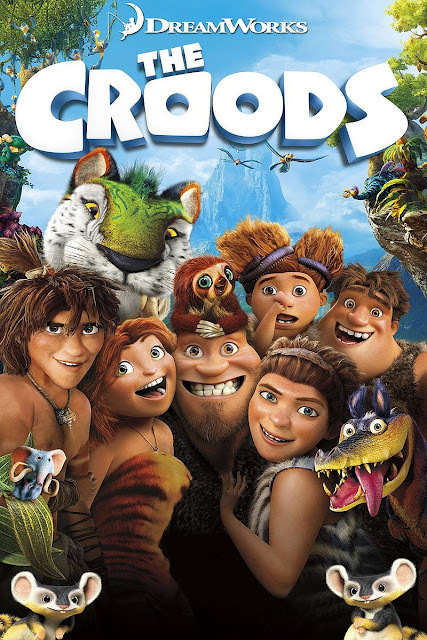 Students of animation will quickly see similarities between "The Croods" and many other animation films set in prehistoric times. Just as in Don Bluth's classic "The Land Before Time" and Disney's "Dinosaur," not to mention the "Ice Age" line of films, our happy little band must embark on a journey to escape danger and find some "promised land." It isn't exactly clear why this same theme always crops up films about dinosaurs and cavemen, but the trope does provide a convenient way to expose the audience to a variety of experiences. On the downside, of course, seeing the same story played out begins to seem repetitive and unoriginal, though naturally each film has unique twists and charming characters. Lots of forbidding creatures in "The Croods" that are kid-friendly. If the story itself is the weak point of "The Croods," especially given its blatant moralizing about the importance of taking risks (one is reminded of Star Trek's Captain Kirk and his corny speech, "Risk is our business"), there are many other things that recommend "The Croods." The 3D CGI animation is dazzling, and there is a lot of goofy fun. Nicholas Cage engages in all sorts of slapstick adventures, and he is excellent at portraying the stereotypical strong-but-weak-minded father. Be forewarned, though, that Cage does not really sound much like a caveman, so his refined tones contrast a bit with his rough character. The emphasis on family is attractive to many, though it robs the film of dramatic tension, and the preponderance of mother-in-law jokes gets a little tiresome. The addition of a true villain might have helped the story, but the film is loaded with enough clichés as it is. The sloth, played by Chris Sanders. The target audience apparently is children, but the box office figures from the opening weekend astonishingly showed that the audience skews older, with 55% above the age of 25. 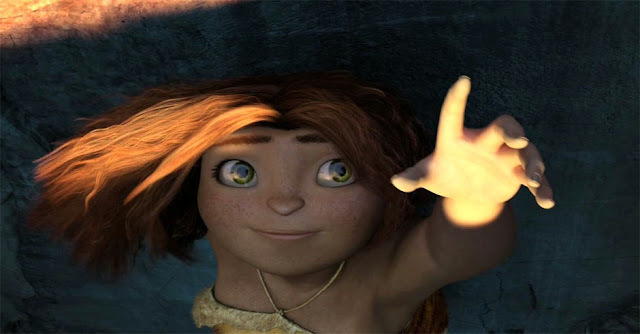 That may partly reflect pent-up demand for a quality non-holiday animation film, the previous one being almost a year earlier, but it shows that anyone can enjoy "The Croods." In any event, kids and the young at heart as well as adults should be engaged by the dramatic but far-from-terrifying adventures of the family, while they also may be drawn to the young but intellectually superior Guy. Eep also is a sympathetic figure for kids, successfully rebelling against her father and ultimately changing him (kids changing their parents seems to be a common theme in current animated films, such as "Brave"). 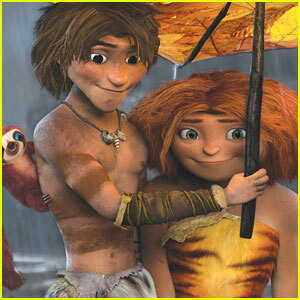 Teenagers and above, especially those who go to a lot of animated feature films, may find "The Croods" a little bland. 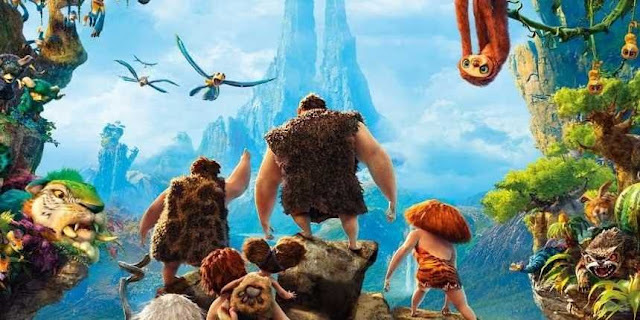 "The Croods" is a worthy addition to the growing line of films about prehistoric adventurers, but it is far from another classic like "The Land Before Time." The story is too derivative and doesn't add much to the genre, unfortunately. The soundtrack by Alan Silvestri is unexceptional, and there are the usual humdrum video game tie-ins by Torus Games and Rovio and action figures and all that. Despite all that, some compare "The Croods" to "The Flintstones," which is a little much. It does have a raucous sensibility at times that is faintly reminiscent of that classic animated television series. The 3D graphics are superb, with lots of subdued pastels. The key problem for spinoffs or sequels is that it is difficult to see how they can turn the Grug/Guy relationship into anything similar to the usual Fred/Barney, Ralph Kramden/Ed Norton or Seinfeld/Kramer sidekick relationship. Besides Nicholas Cage acting goofy in the lead, there is little conflict or comedy. Which isn't to rule anything out, where there's a will, there's a way, we'll have to wait and see what develops. The initial box office success of "The Croods" suggests we may be seeing more of this family of Neanderthals and their human friend in one format or another. Below is the official trailer of "The Croods," and also a key scene. Walt Disney, a man ahead of his time. 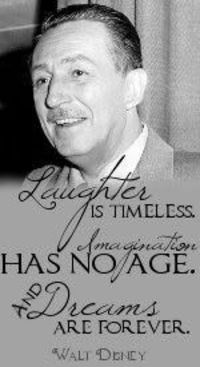 Since so much of this site is devoted to the films of Walt Disney, I thought it appropriate to include this picture of the man and one of his famous quotes.